Unit testing is a level of software testing where individual units/ components of a software are tested. The purpose is to validate that each unit of the software performs as designed. A unit is the smallest testable part of any software. It usually has one or a few inputs and usually a single output. Unit testing process is separate and completely automatic without any manual handling. Every once in a while in development world the same question appears. 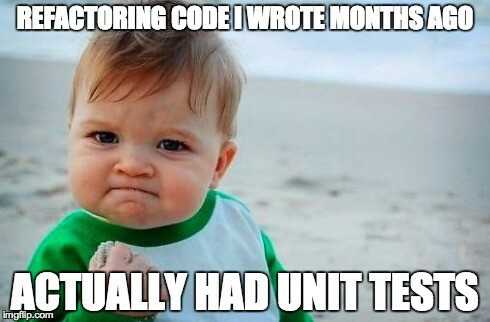 Why would I unit test my code? Is it worth the effort? So what would actually be the benefits of unit testing? Unit testing allows the programmer to refactor code or upgrade system libraries at a later date, and make sure the module still works correctly. The procedure is to write test cases for all functions and methods so that whenever a change causes a fault, it can be quickly identified. Given that we have custom module named Testing under Inchoo namespace (app/code/Inchoo/Testing), our unit tests will reside inside Test/Unit folder according to naming standards. Class that we are going to test will be called SampleClass and will reside in TestingClass folder so the whole path would be – app/code/Inchoo/Testing/TestingClass/SampleClass. As you can see this class is pretty straightforward, it just returns simple string. As you can see this unit test just tests output of the getMessage() method, for test to pass it should be equal to expectedMessage property in the test. Our test extends PHPUnit which gives us assertEquals() method along with many more testing functionalities. There is also setUp() method that is run before testing methods inside of a test, it sets up testing environment along with every class or property that we will need in our test. In this section we will describe how to run Unit tests over PHPStorm. Configuration file tells PHPUnit where to find test cases to run (along with other information). To make it active copy file in the same folder and remove .dist extension, so the name is now phpunit.xml. Now PHPUnit can find our test. To configure PHPStorm to be able to run the tests we need to go to Toolbar > Run > Edit Configurations. After popup window appears we click on plus sign to add new configuration. From the drop-down we choose PHPUnit and under Test Runner section we choose Define in the configuration file and check the Use alternative configuration file and finally select phpunit.xml file we edited earlier. Now PHPStorm knows about our tests and is able to find them. There is just one more step to complete configuring. PHPStorm should also know about PHPUnit library location and interpreter location. To configure this we should go to File > Settings > Languages & Frameworks > PHP > Test Frameworks. Inside this section, we want to add new configuration using + symbol. Under the assumption that we use Composer autoloader we would choose Use composer autoloader option and select vendor/autoload.php. Composer autoloader knows the location of all classes so connecting PHPStorm to autoload.php will finish configuration of PHPStorm successfully. To run our test we can click on the Run icon next to the configuration options in the upper right corner of PHPStorm. Here we have PostDataProcessorTest from CMS module. And we are going to break it down piece by piece. This test tests validateRequireEntry() method from PostDataProcessor class. This method validates input by checking if required fields are empty. If some of the fields are empty the whole request sequence is stopped with an error. In this example setUp() method is creating mocks using MockBuilder and populating test properties with created mocks. There is also PostDataProcessor instantiation, which is logical because testing that class is the whole purpose of this test. PostDataProcessor class requires Date, ManagerInterface and ValidatorFactory dependencies in the constructor, that is why there are mocks of those classes created. Mocks of concrete classes are passed to PostDataProcessor constructor which doesn’t complain since mock is an imitation of real class. Our test class testValidateRequireEntry simulates case in which parameter array with empty title parameter is sent to validation. messageManagerMock will be called just once, method that will be called is addError() method, which will return ‘To apply changes you should fill in hidden required title field’. Since this is just a mock and not real class there must be developer defined method calls and responses. validateRequireEntry() method will return false, because it will try to validate parameters array with empty field and that will cause error in validation and return false. Both assertions will pass in this case. In this article, we have just scratched the surface of Magento 2 unit testing and unit testing in general. This topic is very complex and it is not possible to cover a lot in just one article. So I encourage you to read more about it either from PHPUnit documentation or from Magento 2 specific testing tutorials. Best Magento 2 testing examples are located in Magento core naturally. Happy testing.